Sylvester Stallone is the master at making the most out of simplicity. So good is this action legend at taking a basic idea and making it exist forever, that eventually he tries to give said idea a certain degree of gravitas. How does he do this you say? Take Rocky Balboa. In the first film, this lovable schlub just wants to have a girlfriend and go the distance in a dream title fight. By the fourth film in this wondrous saga, Rocky is defending America on Russian soil and beating a fighter who (realistically) would have KO'd the Italian Stallion in 1 round. In fact, Rocky was almost KO'd in one round, however, the referee let it go on. How's that for Sylvester Stallone making the most of something simple? He did the same thing with Rambo. In the first film, John Rambo was a simple man who just wanted to find common ground with some old veteran buddies. In the second film, he was refighting and winning the Vietnam war for us. In the third film, Rambo was working with a group that (unbeknownst to Sylvester Stallone at the time) would eventually become Al Qaeda. What is Rambo 4 but a hyper-violent tone poem? Which brings us to the final Expendables, which is officially happening at Lionsgate. Okay, Stallone hasn't exactly made his band of merry mercenaries stars in Apocalypse Now. Sure, he's pulled certain plot points from the headlines, but by and large, The Expendable films have been fun, action romps that have steered free of politics. Only time will tell if these films will eventually take on some political undertones that we don't see today. The set-up for these films is extremely simple and one that could go on indefinitely. A CIA operative brings together a group of action legends to handle various jobs. Rather than make the movie the thing, the thing here is always the cast. With the first film, everybody marveled at all the action icons Stallone was able to bring into this new world. Now, by film number four (the one many say is the final Expendables) we've come to expect it. 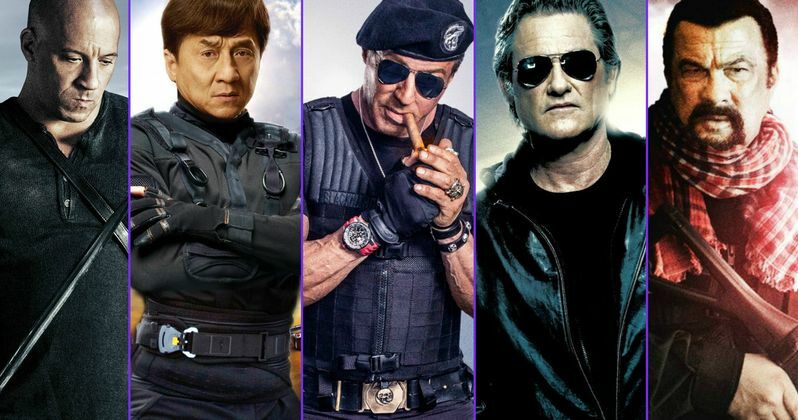 So, that is why we have put together all the action icons, legends and superstars that should be brought in for the big Expendables 4 finale. As much as we want to see a Tango & Cash reunion, putting Kurt Russell in this film wouldn't simply be some 80s cash grab. As of late, one of the best action stars has seen a career resurgence due in large part to his teaming up with Quentin Tarantino. Simply look at Death Proof and The Hateful Eight to see that this guy, even in his mid-60s, still has it. What would his role be? Does it even matter? Just the thought of having Kurt Russell join The Expendables seems like a grand idea. In fact, it could inspire future action icons everywhere. Stallone and Travolta haven't been in a film together, but Stallone did direct Travolta in Staying Alive (the sequel to Saturday Night Fever). So, why hasn't one of America's greatest action icons been in one of The Expendables movies? With films like the Killing Season and Bolt on his resume, it isn't like Travolta is above doing some genre laden (ie. fun) material like a final Expendables film. Why not have John load up and help save the world? Considering how long Travolta and Stallone have been around, they could spend half the movie lampooning their careers. Heck, Travolta's role in Saturday Night Fever makes him an action star based on that alone. Where has this action star been? Well, it seems that after landing a minor part on Dallas in the 1970s, this action icon pretty much worked non-stop til about 2002. Most of the films were of the action variety with the the American Ninja and Avenging Force movies being his biggest. How in the world has Dudikoff not been in an Expendables movie, yet? The guy was even in a TV show called Cobra! Okay, it may have had nothing to do with the Stallone vehicle but there's still some synergy there. Sure, Dudikoff might be a bit long in the tooth now but so is Stallone so why not give a part him in The Expendables 4? If it is the final Expendables it is something Dudikoff has to be in. An action icon like Seagal has always sorta been the black sheep of the action movie business. He just seemed like a guy who wanted to do his own thing. And for awhile, with films like Above the Law, Out for Justice and Under Siege, he had carved a niche as something of a thinking man's vigilante. A modern day Einstein among action stars. Why not get him in The Expendables 4? There's already talk that Seagal might be in this film. Why not cast him as some monk-like figure that Sylvester Stallone corrals to take up one last fight? This could set him up to be in Expendables 5 and then suddenly Seagal is hotter than he was in the 1990s. It seems that this action legend has already been tapped by Sylvester Stallone to be a part of The Expendables Franchise. Jackie Chan said no because he doesn't want to be just another action actor in a big movie with a bunch of action actors. That's fair, but it's also short-sighted on Chan's part. He complains that he doesn't want to be on screen for 5 minutes. Well, if he does a bunch of these films that could end up being 15 or 20 minutes. On top of that, what if his character hits big and it spans a spin-off film? Look Jackie, just be in these films already. Harrison Ford (as Han Solo) has been a character in every Star Wars movie and it took him 40 years to get his own film. So get over yourself and be in the final Expendables!